The Bushnell NEO Ghost Golf GPS rangefinder is pocket-sized for distance made simple. 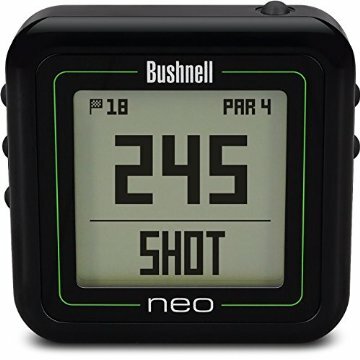 Preloaded with 30,000 courses, the NEO Ghost provides you with large, easy-to-read front, back and center yardages and the auto course recognition and auto hole advance means it is ready to use right out of the box. Up to four programmable hazard/layup distances per hole allow for improved play. Long battery life allows you to play up to three rounds between charging. Legal for tournament play, the NEO Ghost easily fits in your pocket or attaches to your belt, bag or cart. A multifunction clip, USB charging cable and quick start guide are included. One year limited warranty. Last updated: April 20, 2019 at 11:18 EST. Pricing information is provided by the listed merchants. GoSale.com is not responsible for the accuracy of pricing information, product information or the images provided. Product prices and availability is subject to change. Any price and availability information displayed on amazon.com or other merchants at the time of purchase will apply to the purchase of the product. As always, be sure to visit the merchant's site to review and verify product information, price, and shipping costs. GoSale.com is not responsible for the content and opinions contained in customer submitted reviews.